NASA’s InSight probe landed on Mars a few hours ago after a rigorous voyage through space of nearly seven months. The space agency has revealed in its latest update that the probe has also successfully deployed its solar panels – needed to power the lander – on the Red Planet. After reaching Mars’ atmosphere a little before 3 PM EST, InSight made a nerve-racking descent to the planet’s surface. The probe made a complex multi-step routine to slow down from more than 19,000 kmph to just 8 kmph before it hit the ground. For this, InSight had to autonomously deploy a supersonic parachute, gather its radar measurements, and ignite its thrusters – all within seven minutes of reaching the Martian atmosphere. Once InSight successfully landed, NASA’s focus shifted to the probe’s solar panels. These charge the probe’s batteries each day to help it carry out its missions that include listening for seismic vibrations in Mars, shedding light on the planet’s interior structure, and estimating how many meteorites might batter/are on a collision course with the planet. Because Mars is further away from the sun than Earth, it gets weaker sunlight, so it’s crucial that InSight’s solar panels generate as much energy as possible. And since InSight will be conducting experiments for a whole Martian year on the Red Planet (which is about two earth years), the probe has a scaled-up solar panel model compared to the one NASA used in the six-month long Phoenix Mars Lander mission in 2008. 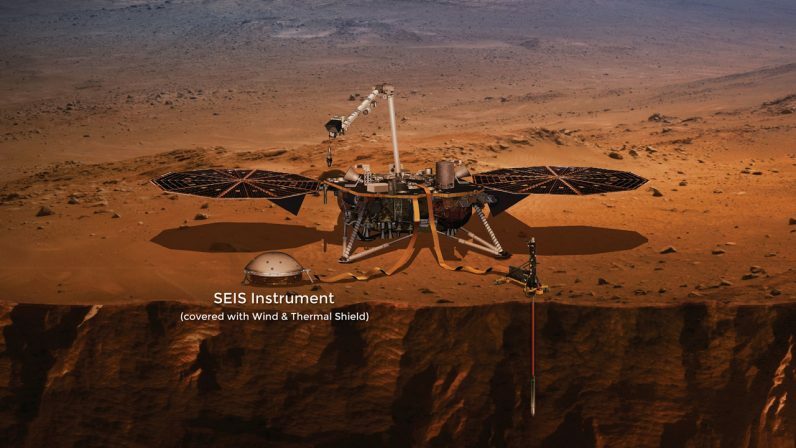 In the following days, NASA’s InSight is expected to conduct a self-audit of all its scientific instruments on board, and survey the martian surface for an optimal site to deploy these instruments. Then, in a couple of months, the probe will set down its seismometer to listen for “Marsquakes,” and dig a 4.9-meter-deep hole to learn about the planet’s interior. Meanwhile, InSight will continue to send reports to earth from its weather sensors and magnetometer. It will be interesting to see what we can learn from data gleaned by the probe. And if you are curious like us, you can follow the mission’s official Twitter page here for updates.